We’re delighted to introduce our amazing new blog contributor Sew Heidi! For the first in her series she’s here to teach us the basics of Adobe Illustrator, an invaluable tool for your design. If you’ve ever heard people talking about Adobe Illustrator, you may have wondered what the software does and who uses it. Perhaps you’ve even dabbled a bit in it. If you haven’t, you’re not out of the loop! This article will take you through what the software is, what fashion designers use Adobe Illustrator for, and get you caught up on the basics. 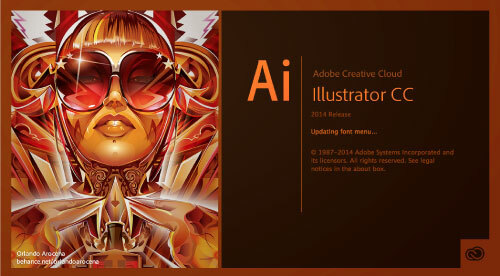 What Is Illustrator For & Who Uses It? Simply put, Illustrator is a CAD (computer aided design) software. It’s used in many industries for various graphic design purposes ranging from simple logos and business cards to more complex illustrations for things like greeting cards or wrapping paper. Illustrator is also used by many fashion designers due to its reasonable price (less than US$20 or £17.15 per month) and versatile capabilities. While software specific to fashion design does exist, it’s often cost prohibitive and very specialised, limiting who can use it and what can be created. So, what do fashion designers use Illustrator for? One of the most common uses of Illustrator in the fashion world is for drawing flat sketches. “Flats” are black and white drawings that include all construction and styling details (as opposed to fashion illustrations, which tend to be more of an artistic representation). With callouts for construction details added, they’re converted to tech sketches, which include specific instructions for a manufacturer to follow. With it’s powerful pattern-making tool, it’s easy to create custom repeating patterns in Illustrator and use them in flats to mock up designs. This tool allows you designers to infinitely customise the size, colours and directionality of the pattern to easily see how it will look in a variety of options. 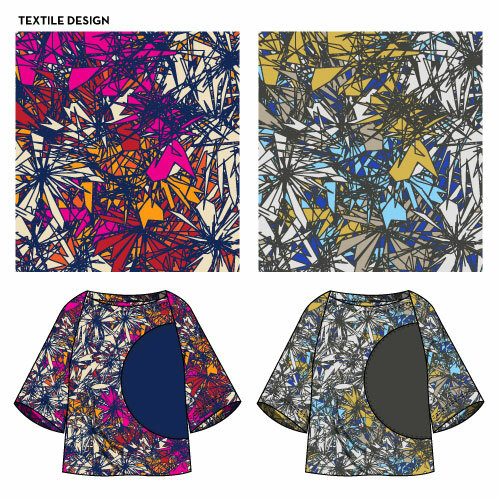 In addition to being able to create custom textiles, designs can also be mocked up in Illustrator using existing fabrics. 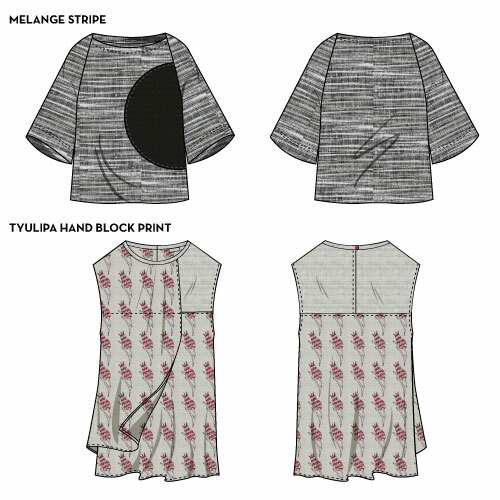 It’s fairly easy to convert an image of any fabric found online, such as this black and white melange stripe or Tyulipa hand block print (two fabrics available from Offset Warehouse) into a pattern and fill the blouse. 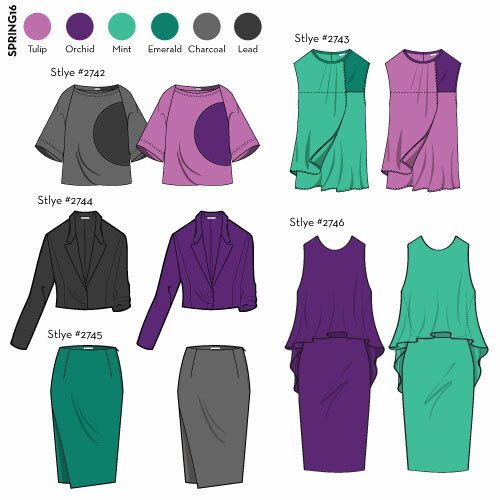 This is a great way to get a visual of how a textile will look in a completed garment before purchasing fabric. 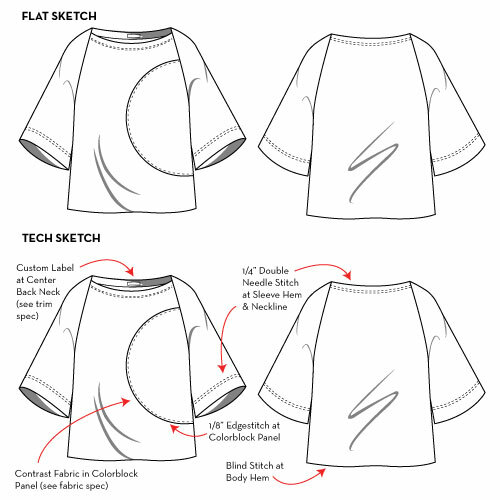 Once all garments are completed, the design process typically wraps up with the collection merchandised on a line sheet. Yes, this too can be done in Illustrator! These layouts are great for buyer presentations, sales catalogs, web presence and can really help you present your line as a whole. Illustrator is a complex and very powerful software, but with some training and practice, any designer can learn how to maximise its potential to realise your designs. If you’re so inclined to get started right away, you can grab a free 30-day trial from Adobe and follow tutorials available at Illustrator Stuff or Sew Heidi. Sew Heidi is a fashion tech evangelista, educator and advocate. With 12 years experience working professionally as a fashion designer, she uses her skills and experience to teach Illustrator via written and video tutorials. She’s also co-founder of Illustrator Stuff, an online marketplace for fashion flats, trim libraries and repeating patterns. If you like these articles, then please do sign up to our monthly newsletter, where I round up all the latest posts. You can tweet the article using the tweet buttons throughout the article and below. Its wonderful, thanks for this valuable information. Thank you for the question! Honestly I haven’t used Coreldraw so I cannot share my experience. From what I know, they are quite similar programs, however I believe that AI is more widely used and is also compatible across a suite of programs (ie Photoshop and InDesign). In all of the professional fashion and graphic design work that I have done in 10+ years, almost all of the people I have worked with use AI. Hope this helps! I am so impressed the way you r teaching the designing programme.. I am greatful to learn about illustrator from you..
please do provide us more of it..
I’m looking to start my own clothing line and have been recommended Adobe Illustrator to get my designs started, is seems great to get the initial idea down but how do I get patterns made up? how do I know the measurements per UK size? material types? Sublimation Printing Process & What Makes It Eco Friendly? a) Its AL can consider one of the Categories of CAD (computer Aided Design)? b) How AL can help designing for Small medium business (SMEs)? because they tend to do all the process using manually. How to impress them by using the AL can help them on designing process? c) Can AL do the pattern? if can how to do it in actual size? I want to be in your group. I also want to do design with you. I want to buy an Adobe Illustrator to design knitting and crocheting pattern? Which program should I buy?